Septuagenarian of Special Frontier Force celebrates 69th Republic Day of India. 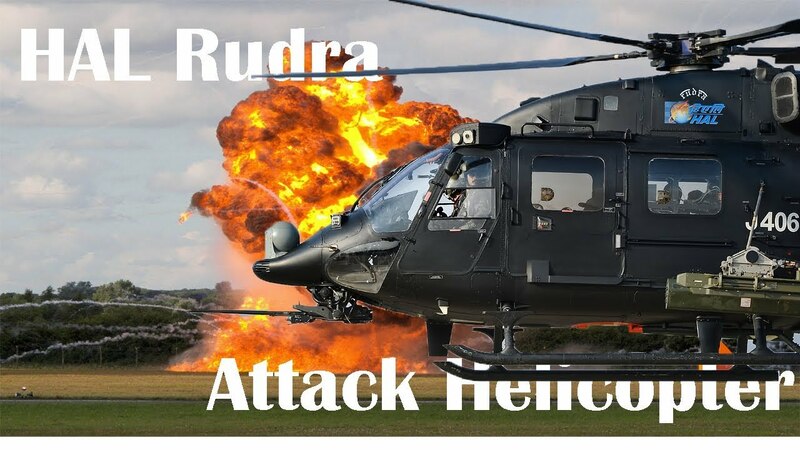 From Rudra About Rudra’s Maiden Appearance. Septuagenarian of Special Frontier Force reminds his readers about Tibet’s military occupation since 1950. He is celebrating 69th Republic Day of India while Asia’s third largest nation remains under Colonial Oppression, Repression, Suppression, and Tyranny imposed by People’s Republic of China. 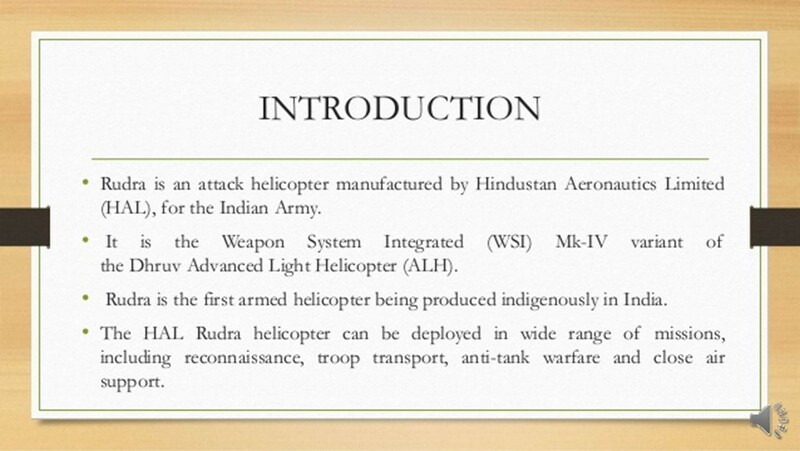 This Year’s Republic Day is of great interest for it gives me (Rudra) to speak about Rudra’s Maiden Appearance apart from ‘ASHWINI’ ( my son’s first name) Radar developed by Defence Development and Research Organization(DRDO). This Father-Son first-time appearance in 69th Republic Day Parade defines the term ‘KARMA’. Septuagenarian of Special Frontier Force Celebrates 69th Republic Day of India featuring Rudra and Ashwini, together for the first time. 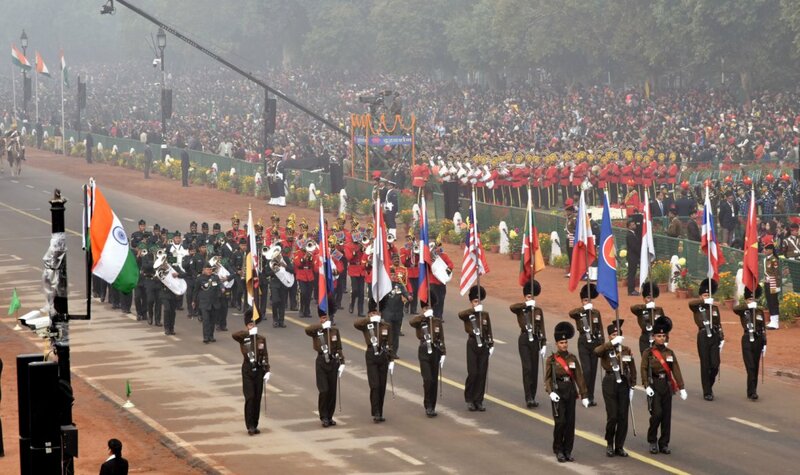 India today celebrated its 69th Republic Day with a grand display of the country’s military might and rich cultural diversity in presence of leaders from all the ASEAN nations, in a historic first and unprecedented strategic outreach to the powerful bloc. This is for the first time that leaders from 10 countries attended the annual celebrations as chief guests, and the overwhelming presence of the ASEAN leadership is seen as reflection of India’s growing stature as a major power in the region where China has been expanding its footprint. Septuagenarian of Special Frontier Force Celebrates 69th Republic Day of India. 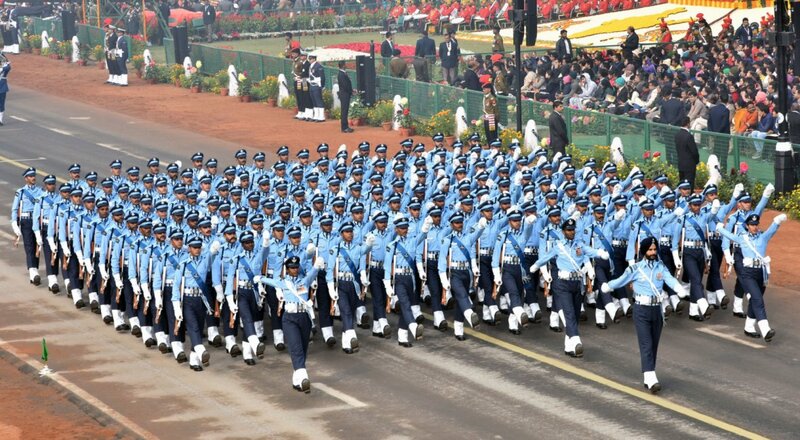 Marching contingent of Delhi Police. From Rudra About Maiden Appearance of RUDRA and ASHWINI. 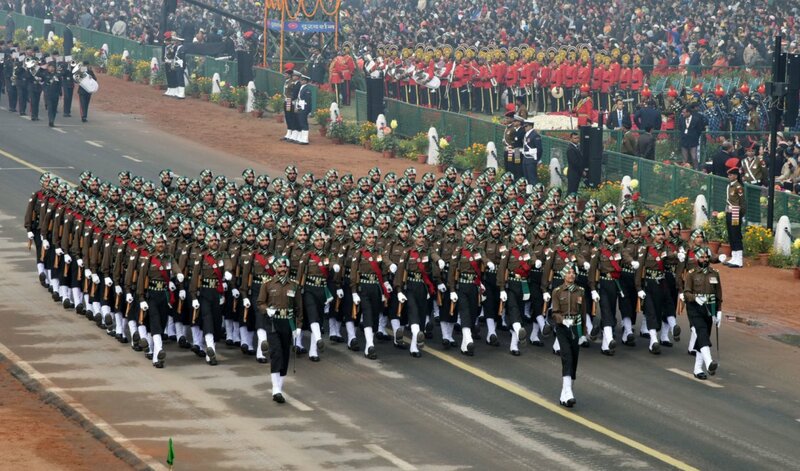 Thousands of people on both sides of the Rajpath, India’s ceremonial boulevard facing the seat of power on the Raisina Hill, braved the winter chill and cheered loudly as the marching contingents and tableaux went past them. Myanmar’s State Counsellor Aung San Suu Kyi, Vietnam Prime Minister Nguyen Xuan Phuc, Philippines President Rodrigo Duterte, Thai Prime Minister Gen Prayut Chan-o-cha, Singaporean Premier Lee Hsien Loong and Brunei’s Sultan Haji Hassanal Bolkiah were among the ASEAN leaders who attended the event. Septuagenarian of Special Frontier Force Celebrates 69th Republic Day of India. 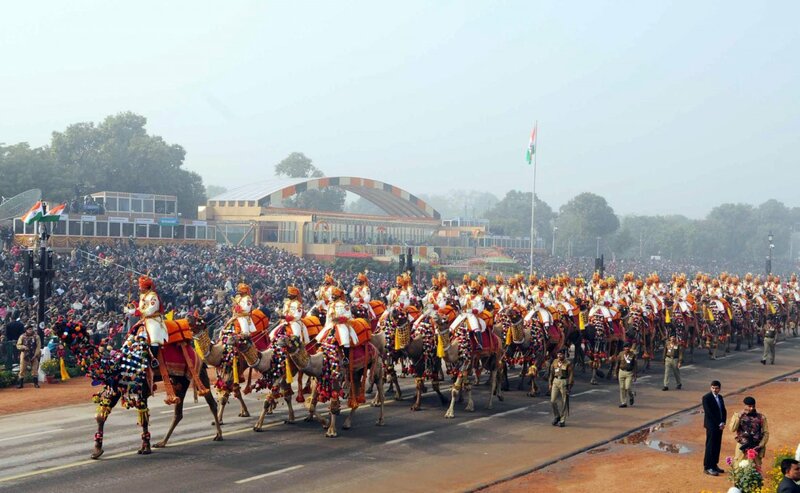 Guests of Honor leaving at the end of Republic Day Parade. From Rudra About Maiden Appearance of Rudra and Ashwini. In a series of tweets, Modi talked about India’s partnership with Asean and yesterday’s India-Asean Commemorative Summit. “Their presence with us is an unprecedented gesture of goodwill from Asean nations.” Before the beginning of the ceremony marking the date when India’s Constitution came into force way back in 1950, Prime Minister Narendra Modi, wearing a saffron, red and green safa (headgear), paid homage to the martyrs by laying a wreath at Amar Jawan Jyoti at the India Gate. The parade was commanded by Lt General Asit Mistry, General Officer Commanding, Headquarters Delhi Area. The supreme commander of the Indian armed forces President Ram Nath Kovind took the salute at the parade. India’s highest peacetime military decoration Ashok Chakra was posthumously given to IAF Garud commando Corporal Jyoti Prakash Nirala, who laid down his life after gunning down two terrorists in Jammu and Kashmir. The award was received by Corporal Nirala’s wife Sushmanand and his mother Malti Devi. The celebrations were attended by most of the Union ministers, including Home Minister Rajnath Singh, Finance Minister Arun Jaitley, Health Minister JP Nadda, Information and Broadcasting Minister Smriti Irani, Law Minister Ravi Shankar Prasad and Environment Minister Harsh Vardhan. Septuagenarian of Special Frontier Force Celebrates 69th Republic Day of India. Prime Minister Narendra Modi greeting people. From Rudra About Maiden Appearance of Rudra and Ashwini. India’s former prime minister Manmohan Singh, Delhi chief minister Arvind Kejriwal and deputy chief minister of Delhi Manish Sisodia were also present on the occasion. A march-past by the Army personnel carrying the ASEAN flag also featured during the parade. The Army personnel also carried the flags of the 10 Asean nations in the parade. 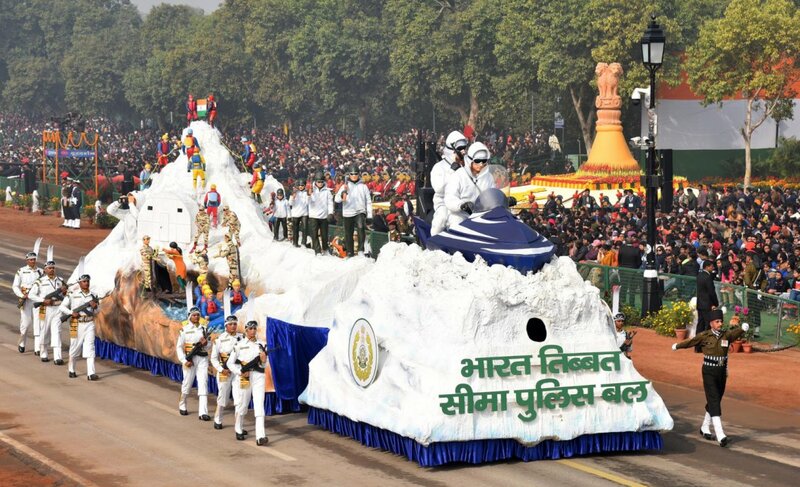 Twenty three tableaux, including those representing various states, ministries, the All India Radio among others, rolled down the Rajpath. The highlight of the parade was the motorcycle contingent, ‘Seema Bhawani’, comprising women personnel of the BSF that showcased their skills for the first time at the parade. Septuagenarian of Special Frontier Force celebrates 69th Republic Day of India. Border Security Force(BSF) Women Contingent ‘Seema Bhawani’ on motorcycle passes through Rajpath. Septuagenarian of Special Frontier Force celebrates 69th Republic Day of India. 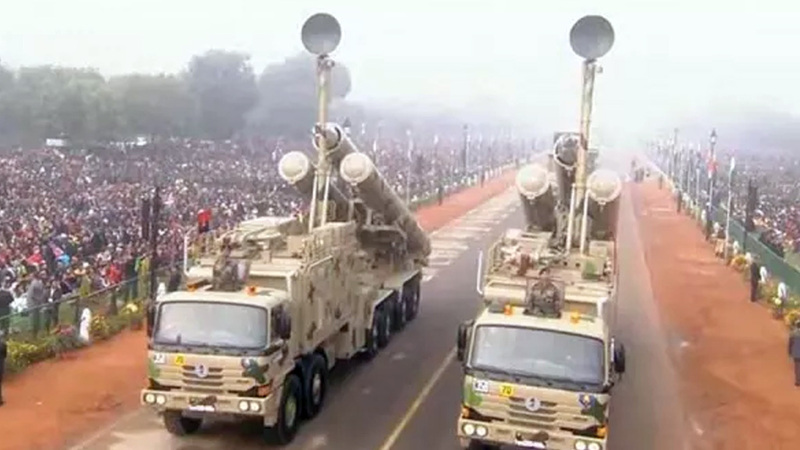 BRAHMOS Missile Weapon System passes through Rajpath. Septuagenarian of Special Frontier Force celebrates 69th Republic Day. T-90 Tank BHISHMA passes through Rajpath. 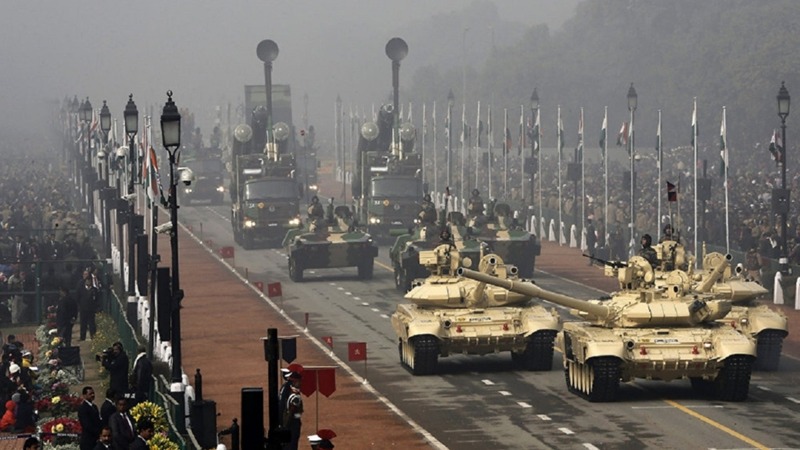 The Indian Army’s T-90 tank (Bhishma), Ballway Machine Pikate (II/IIK), Brahmos Missile System, Weapon Locating Radar (Swathi), Bridge Laying Tank T-72, Mobile Base Transceiver Station and Akash Weapon System were also showcased at the parade. Septuagenarian of Special Frontier Force celebrates 69th Republic Day of India. 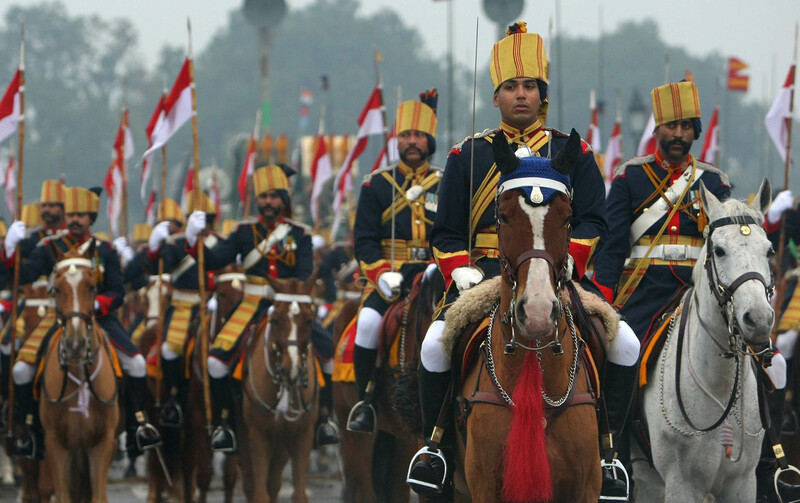 61 Cavalry Regiment contingent passes through Rajpath. 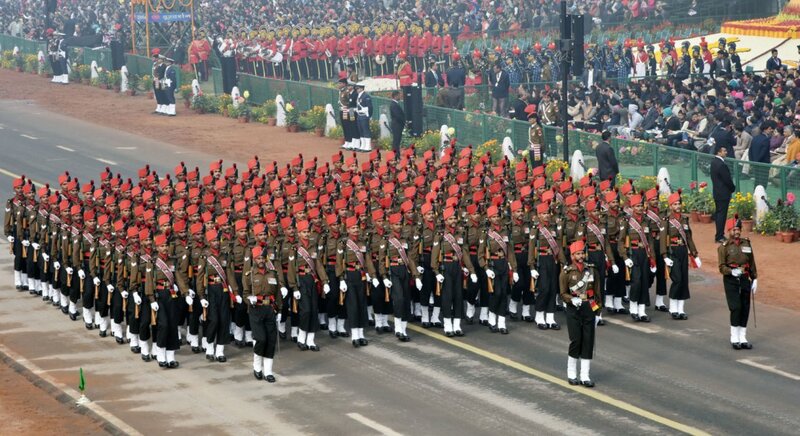 The marching contingent of the Army included horse- mounted columns of the 61st Cavalry, the Punjab Regiment, Maratha Light Infantry, the Dogra Regiment, Ladakh Scouts and the Regiment of Artillery and 123 Infantry Battalion — Territorial Army (Grenadiers). 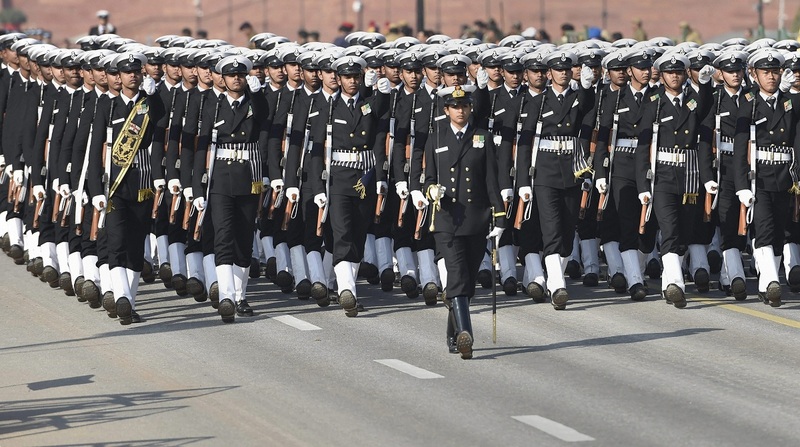 The marching contingent of the Navy, comprising 144 young sailors, was led by Lieutenant Tushar Gautam, while the Indian Air Force contingent, comprising 144 men, was led by Squadron Leader Attal Singh Sekhon. Septuagenarian of Special Frontier Force celebrates 69th Republic Day of India. Border Security Force(BSF) contingent featuring Dara Singh passes through Rajpath. 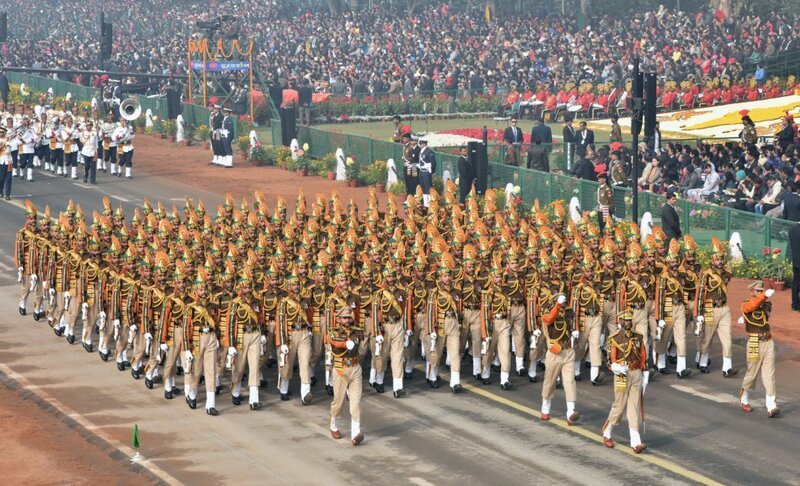 The paramilitary and other auxiliary civil forces, including the Border Security Force, also marched on Rajpath. Septuagenarian of Special Frontier Force celebrates 69th Republic Day of India. 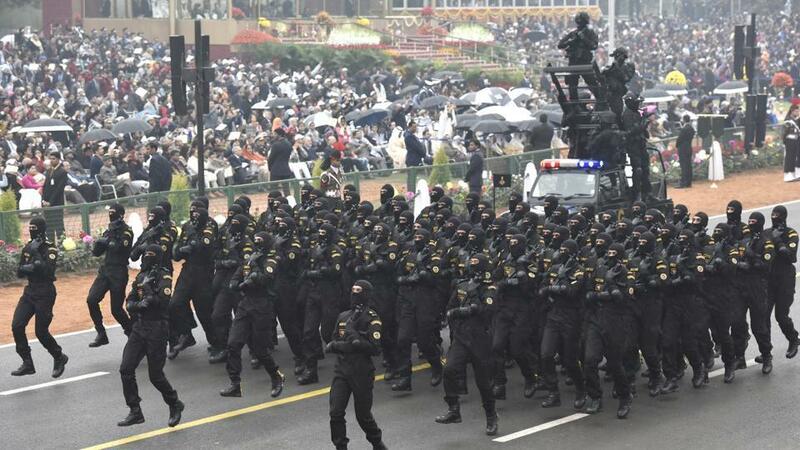 National Security Guard(NSG) Commandos marching contingent passes through Rajpath. Septuagenarian of Special Frontier Force celebrates 69th Republic Day of India. ‘Seema Bhawani’ BSF Women Contingent on Motorcycles. This year, the Indian Navy’s Tableau showcased the theme ‘Indian Navy – Combat Ready Force for National Security’. 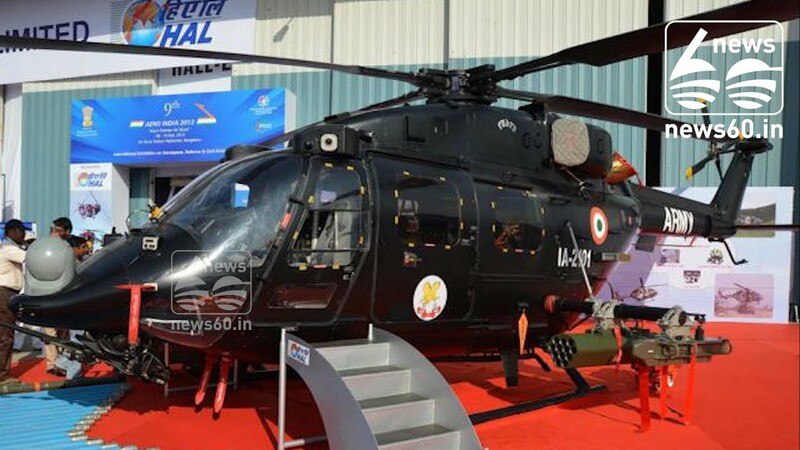 The Navy also showcased its Indigenous Aircraft Carrier (IAC) Vikrant, which will be commissioned in 2020, while the Defence Development and Research Organization exhibited the ‘Nirbhay’ missile and the Ashwini radar system. 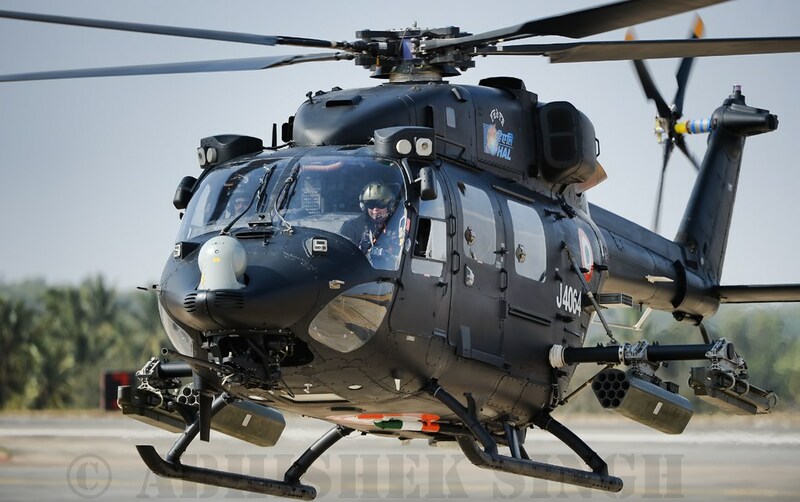 The theme of the Indian Air Force tableau was ‘Indian Air Force Encouraging Indigenization’ which displayed models of the Tejas Multi-role Fighter Aircraft, Rudra Helicopter, Ashwini Radar and the Akash missile system. Septuagenarian of Special Frontier Force celebrates 69th Republic Day of India. 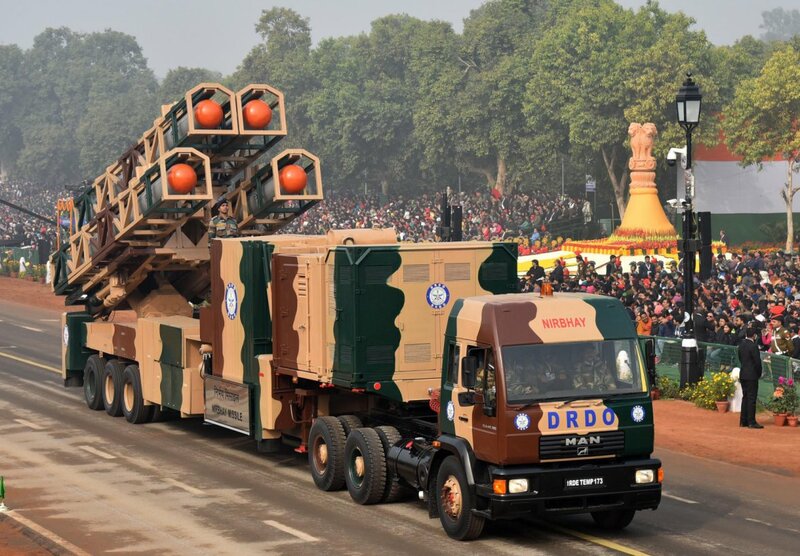 ‘AKASH’ Missiles passes through Rajpath. The All India Radio tableau featured Modi’s monthly address ‘Mann Ki Baat’ and was one of the many firsts this year. An Income Tax Department tableau, about special anti- black money drive launched post-demonetization, that rolled down Rajpath, was also on the list of many firsts. On behalf of the central government, 61 tribal guests from various parts of the country had been invited to witness the Republic Day celebrations. Fifteen of the 18 children who won the National Bravery Award also participated in the parade. Three children, including two girls, have received the award posthumously. Septuagenarian of Special Frontier Force celebrates 69th Republic Day of India. Recipients of 2017 National Bravery Awards passing through Rajpath. In the children’s section, over 800 boys and girls drawn from three schools in Delhi along with a group of school children from Nagpur and Dimapur, performed colorful dances on different themes. 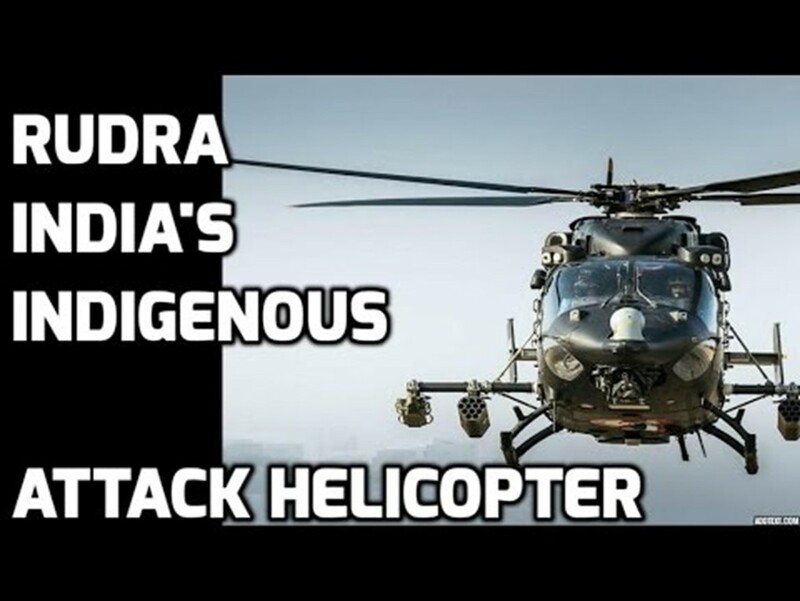 The grand finale of the parade was a spectacular fly past by MI-17 and RUDRA armed helicopters along with a number of IAF aircraft. 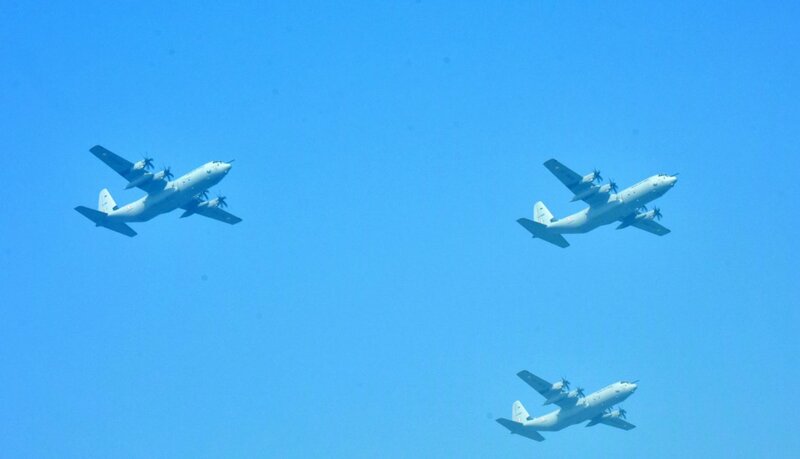 The fly past commenced with the ‘Rudra’ formation comprising three ALH Mk IV WSI helicopters in ‘Vic’ formation, followed by the ‘Hercules’ formation comprising three C-130J Super Hercules aircraft. Septuagenarian of Special Frontier Force celebrates 69th Republic Day of India. 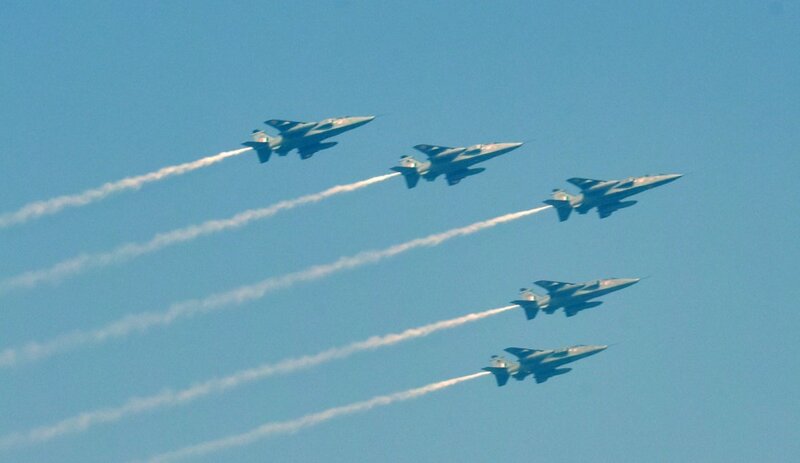 Indian Air Force(IAF) Su-30 MKI planes fly past at Rajpath. Trailing them was the ‘Netra’ which is an Airborne Early Warning and Control System Aircraft also known as ‘Eye in the Sky’. ‘Netra’ was followed by the ‘Globe formation’ comprising one C-17 Globemaster flanked by two Su-30 MKIs among others. Minutes before the parade began, the prime minister, Defence Minister Nirmala Seetharaman and Chiefs of the Army, Navy and Air Force paid tributes at the ‘Amar Jawan Jyoti’, the war memorial at India Gate where an eternal flame burns in memory of those who laid down their lives defending the frontiers of the nation. As per tradition, after unfurling the national flag, the national anthem played followed by a 21 gun salute. The ceremony ended also with the playing of the national anthem and the release of thousands of balloons. Septuagenarian of Special Frontier Force celebrates 69th Republic Day of India. Indian Air Force(IAF) Tejas Multi-Role Fighter Aircraft passes through Rajpath. Septuagenarian of Special Frontier Force celebrates 69th Republic Day of India. 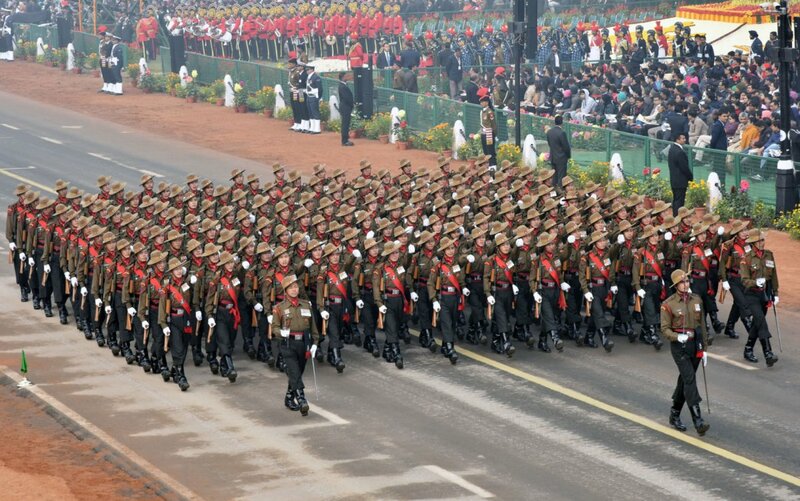 123 Infantry Battalion (Territorial Army) Grenadiers Regiment marching contingent passes through Rajpath. Septuagenarian of Special Frontier Force celebrates 69th Republic Day of India. 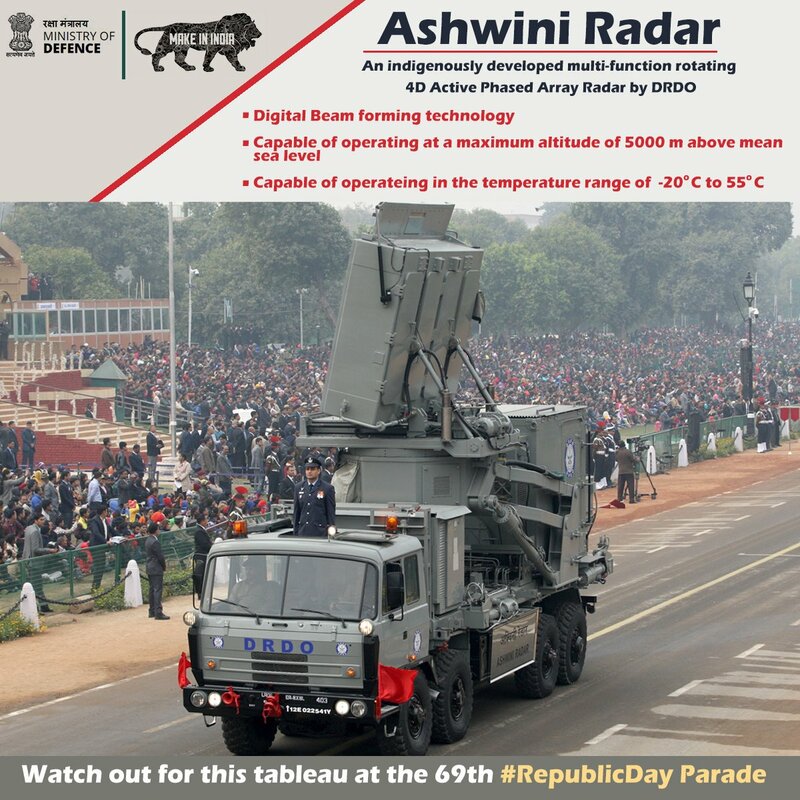 “ASHWINI” Radar passes through Rajpath. Septuagenarian of Special Frontier Force Celebrates 69th Republic Day of India. 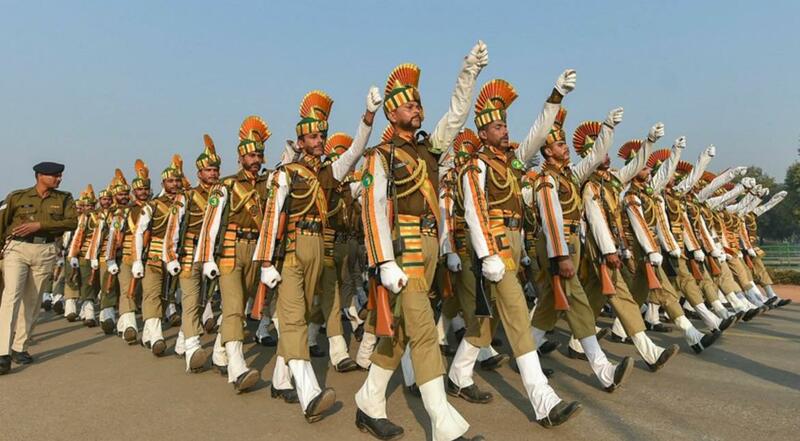 Marching contingent of PUNJAB Regiment. Septuagenarian of Special Frontier Force Celebrates 69th Republic Day of India. Marching contingent of DOGRA Regiment. Septuagenarian of Special Frontier Force Celebrates 69th Republic Day of India. Marching contingent of Maratha Light Infantry Regiment. Septuagenarian of Special Frontier Force Celebrates 69th Republic Day of India. Border Security Force, BSF Camel Contingent. Septuagenarian of Special Frontier Force celebrates 69th Republic Day of India. 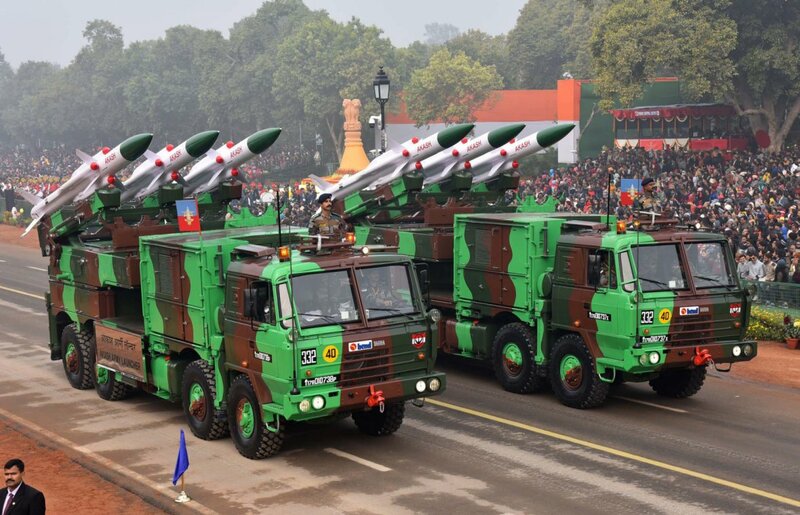 Nirbhay Missile on display during Republic Day Parade. Septuagenarian of Special Frontier Force Celebrates 69th Republic Day of India. Indian Air Force marching contingent. Septuagenarian of Special Frontier Force celebrates 69th Republic Day of India. Indian Army Band with ASEAN Nation Flag Bearer contingent marching in Republic Day Parade. Septuagenarian of Special Frontier Force celebrates 69th Republic Day of India. C-17 Globemaster plane fly over Rajpath. Septuagenarian of Special Frontier Force celebrates 69th Republic Day of India. Five Jaguar Fighter planes fly over Rajpath. Septuagenarian of Special Frontier Force celebrates 69th Republic Day of India. Indo Tibet Border Police contingent passing through Rajpath. Septuagenarian of Special Frontier Force celebrates 69th Republic Day of India. Mobile-Base-Transceiver-Station passes through Rajpath. Septuagenarian of Special Frontier Force celebrates 69th Republic Day of India. 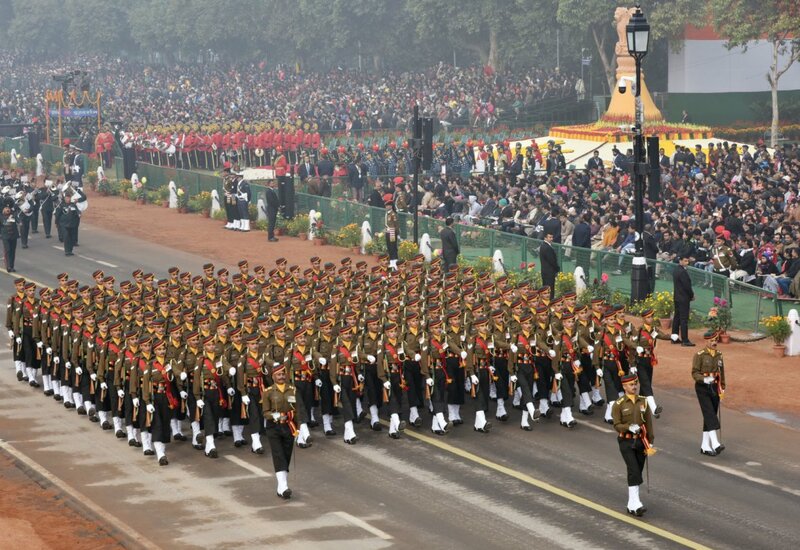 ITBP Marching contingent passes through Rajpath. Septuagenarian of Special Frontier Force celebrates 69th Republic Day of India. Ladakh Scouts Marching contingent passes through Rajpath. Septuagenarian celebrates 69th Republic Day of India. 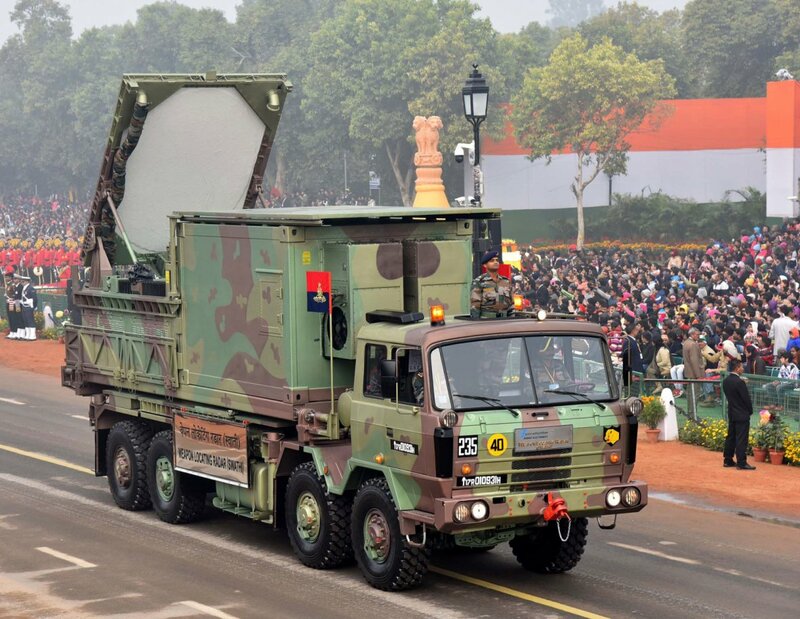 Weapon Locating Radar “SWATHI” passes through Rajpath. Septuagenarian of Special Frontier Force celebrates 69th Republic Day of India. 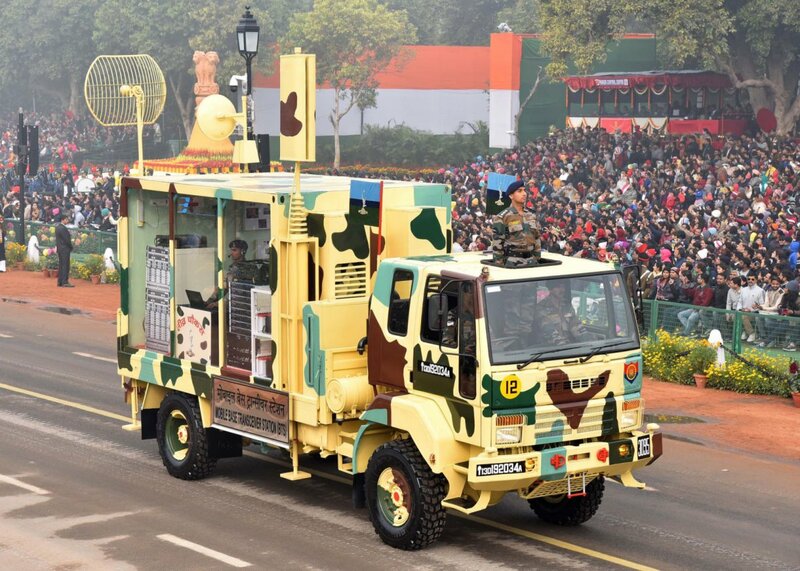 ‘AKASH’ Missile Launcher of Army passes through Rajpath. From Rudra About Rudra’s Maiden Appearance at 69th Republic Day Parade. 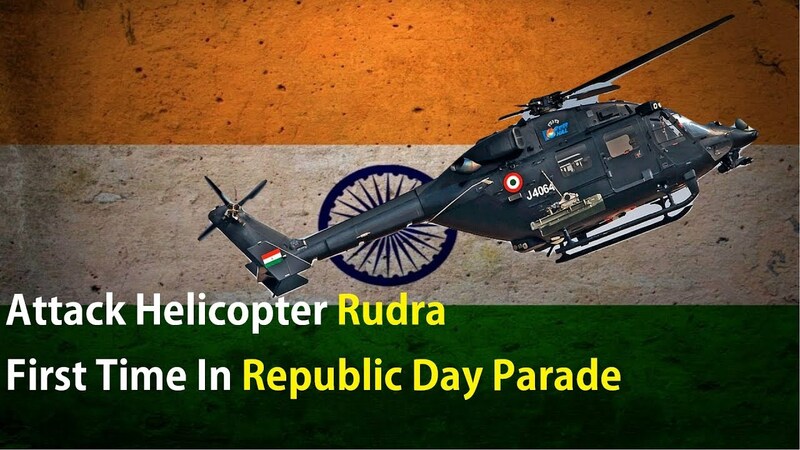 From Rudra About Maiden Appearance of Rudra at 69th Republic Day Parade. 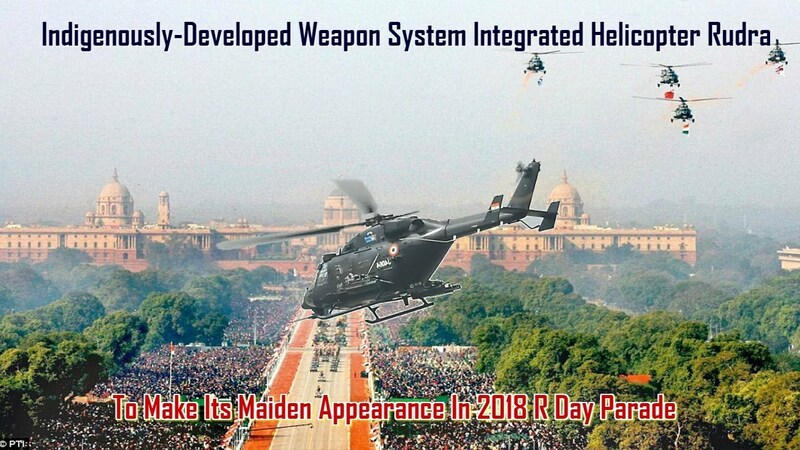 From Rudra About RUDRA – First Time in Republic Day Parade 2018.